"John is married to Delores and lives in Litchfield, MI. They have 5 children & 17 grandchildren as of May 2009. 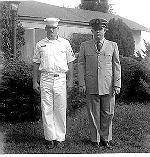 He enlisted in the Naval Reserve on 16 October 1954 & had basic training under Barney Gonyea BM1. After making a cruise, he went on active duty 9 December 1955 at NFB as an Airman Apprentice and worked in the Aircraft Maintenance Electronics Shop. On 16 November 1958 he was promoted to AT1, one of the youngest first class in the Navy. A short time later he was encouraged by Lcdr's Buck & Folsom, and later Cdr. Boyd to apply for the Naval Enlisted Scientific Education Program, NESEP. In Apr 1960 was selected for NESEP and left NFB 4 Jun 1960. He was the second man to go to NESEP from NFB and the first TAR. After about 10 weeks at the Naval Preparatory School in Bainbridge, MD, was ordered to Purdue University as a NESEP student in the School of Electrical Engineering. On 16 July 1962 was promoted to ATCA. Graduated with a BSEE degree on 31 May l964. After completing the LDO course in the Naval School of Preflight, Pensacola was Commissioned Ensign USN ON 16 October 1964 as an Aviation Support Officer, 1350. His first duty as an officer was on the USS INDEPENDENCE CVA-62, were he was the Electronic Data Processing Officer in the Integrated Operational Intelligence Center. During this time he made a Westpac Cruise in 1965 and a Med Cruise in 1966. He departed the INDEPENDENCE in December 1966. He reported to the Strategic Systems Projects Office, SSPO, Washington, D.C. in January 1967 as a Project Officer in the Navigation Branch. In April 1967 he participated in the third builders sea trial of the USS WILL ROGERS, SSBN 659. In November 1968 he was selected to be an Engineering Duty Officer, 1400. After 3 years of dealing with contractors, departed SSPO in August 1970. His last duty station was SUPSHIP, Supervisor of Shipbuilding, Conversion and Repair, Portsmouth, VA. SUPSHIPS administer the Navy contracts with private shipyards for construction and repair of Navy ships. He was the Inspection Officer for 3 years in the Hampton Roads area. Next was the Planning and Estimating Superintendent for 18 months. Then spent his last year as the Advanced Planning Officer, making preparations 3 to 5 years in advance of overhauls. His last 9 years in the Navy was spent dealing with contractors. Retired after 20 years active duty in Portsmouth, VA as LT. Engineering Duty Officer.